Sarah Brock is an award winning makeup artist and is the Director of Makeup Artistry for Daniel Sandler. Quoted by Conde Nast Brides Magazine as the ‘industry leader in bridal makeup’ and by Vogue as the ‘go-to makeup artist for award winning makeup’, Sarah is highly sought after by brides for their wedding day makeup. You will see Sarah’s work on the cover of Brides Magazine and also in major bridal ad campaigns. 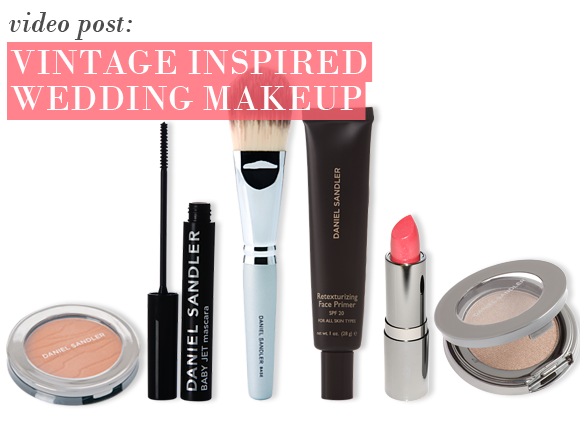 Here, Sarah creates a vintage makeup look using Daniel’s products for Wedding TV – Bridal Boudoir. Recreate the look with these gorgeous products..
1. Apply the Daniel Sandler Re-texturising Primer all over the face. This works to fill in fine lines and provide the perfect canvas for make-up application. 2. Using the Daniel Sandler Base Brush, apply the Daniel Sandler Waterbase Foundation. This innovative product also includes a matching concealer in the lid to cover imperfections. 3. Dust the Daniel Sandler Invisible Veil Loose Powder all over the face with the Daniel Sandler Contour-Powder Brush. 4. Take that same brush and contour the cheeks with the Daniel Sandler Mineral Matte Blush in Natural Beauty. 1. Apply the Daniel Sandler Sheer Satin Shadow in Gilded Taupe from lash to brow with Daniel Sandler Eye shadow 1 Brush. Repeat the same application with the Daniel Sandler Polychromatic Eye Shadow in Rosy Tan. Contour with the Daniel Sandler Sheer Satin Shadow in shade Copper Bronze and using the Daniel Sandler Smudger Brush, apply first to the contour of the eye and along the lower lash line. 2. To achieve beautiful eyeliner, use the Daniel Sandler Eye Love It in Rock Chick – apply a tiny amount to the back of your hand and using the Daniel Sandler Liner Brush, swipe the brush into the product and pull your brow up so your eyelid is smooth. Apply to your top lash line – thinner at the inner corner and thicker towards the outer corner. 3. Use the Daniel Sandler Baby Jet Mascara after curling the lashes, to get a thick, glossy look to the lashes. 1. Take the Daniel Sandler Automatic Long-Lasting Lip Liner in Heather and apply all over the lips. 2. Finish with an application of Daniel Sandler Luxury Lipstick in Loveable. This is a review for shade ''Asteroid'' bought this as I read Binkys makeup essentials, and decided to buy. Unusual colour brown, grey, bronzey, a bit different from the colours I usually use like navy or black. Good staying power a nice smokey sparkly day or night look. This entry was posted on Tuesday, July 26th, 2011 at 9:00 am and is filed under Guest bloggers, Hints & Tips, Lifestyle, Make-up. You can follow any responses to this entry through the RSS 2.0 feed. You can skip to the end and leave a response. Pinging is currently not allowed.